HiCExplorer addresses the common tasks of Hi-C data analysis from processing to visualization. HiCExplorer is available as a command line suite of tools on this GitHub repository. A Galaxy HiCExplorer version is directly available to users at http://hicexplorer.usegalaxy.eu. Training material is available at the Galaxy Training Network, while a Galaxy Tour is available here for users not familiar with this platform. Galaxy HiCExplorer is also available as a Docker image at the Docker Galaxy HiCExplorer GitHub repository. Finally, this Galaxy version is available on the Galaxy Tool Shed and on the corresponding GitHub repository. hicTransform Computes a obs_exp matrix like Lieberman-Aiden (2009), a pearson correlation matrix and or a covariance matrix. These matrices can be used for plotting. hicMergeTADbins Uses a BED file of domains or TAD boundaries to merge the bin counts of a Hi-C matrix. hicPlotViewpoint A plot with the interactions around a reference point or region. hicAggregateContacts A tool that allows plotting of aggregated Hi-C sub-matrices of a specified list of positions. 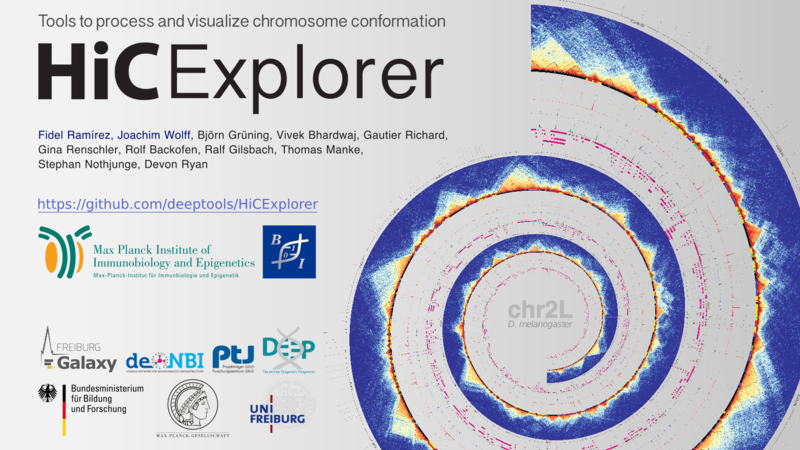 This tool suite is developed by the Bioinformatics Unit at the Max Planck Institute for Immunobiology and Epigenetics, Freiburg and by the Bioinformatics Lab of the Albert-Ludwigs-University Freiburg, Germany. © Copyright 2018, Fidel Ramírez, Bjoern Gruening, Vivek Bhardwaj, Joachim Wolff Revision 018edba1.